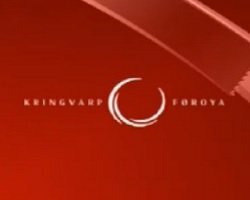 General TV Channel / Kringvarp Føroya is the national broadcasting company of the Faroe Islands. It was founded on 1 January 2005 after a merging of the national Faroese radio (Útvarp Føroya) and the national Faroese Television (Sjónvarp Føroya). Útvarp Føroya (ÚF) was founded in 1957. The first director was Axel Tórgarð. In 1960 Niels Juel Arge became director and continued until 1990. Prior to the establishment of Útvarp Føroya the Faroese people could listen to foreign radio stations. The most common one to listen to was the National Norwegian Radio Station, popularly referred to as Norðmaðurin (which means: The Norwegian or The man from Norway). The BBC was also popular. These stations were mainly used for daily weather forecasts. Sjónvarp Føroya (SvF) means "Television of the Faroe Islands", it was founded in 1984. It was the only public TV station in the small country of 48,000 inhabitants, speaking their own Faroese language. The history of SvF goes back to the 1960s. In 1969, the Faroese parliament (Løgting) decided to found a stock for developing TV facilities on the islands under public law. The law of 1978 arranged the realisation of the network, which was finally founded as Sjónvarp Føroya in 1981. An old furniture store in the capital Tórshavn was converted into a TV studio in 1983, and on April 1, 1984 the first Faroese programme was launched; however, private local TV associations had by then been transmitting for six years. The regular operation of SVF started on September 1 the same year.